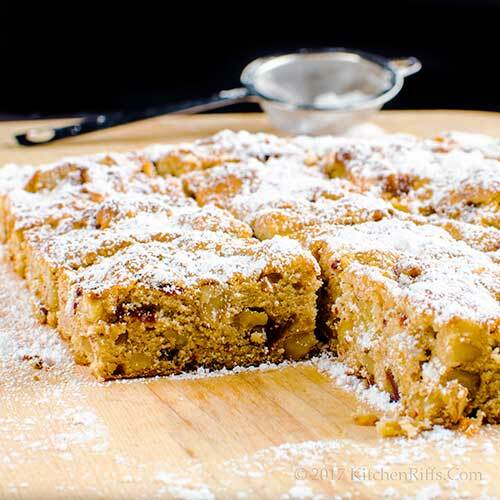 Date-and-nut squares (aka bars) are a classic at holiday time. Problem is, many recipes yield dense – and filling – concoctions. This recipe is lighter, but still packs plenty of flavor. Your guests will appreciate that. Because they’ll certainly want more than one. So for your next holiday bash, we suggest baking a double batch of these beauties. You’ll have leftovers, but that’s the point. Because these are wonderful for breakfast, too. 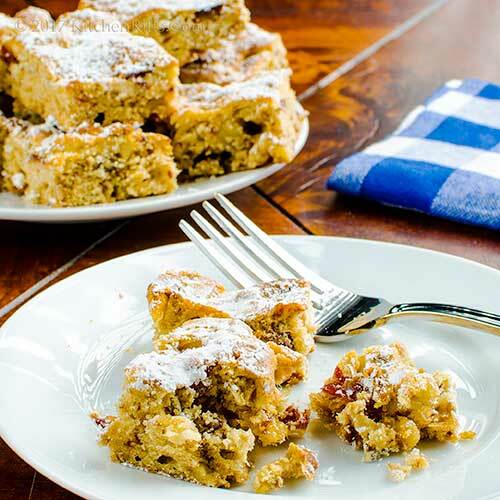 Date-and-nut squares often call for streusel topping. Those are good, but more complicated to make, and the cookies tend to be heavy. 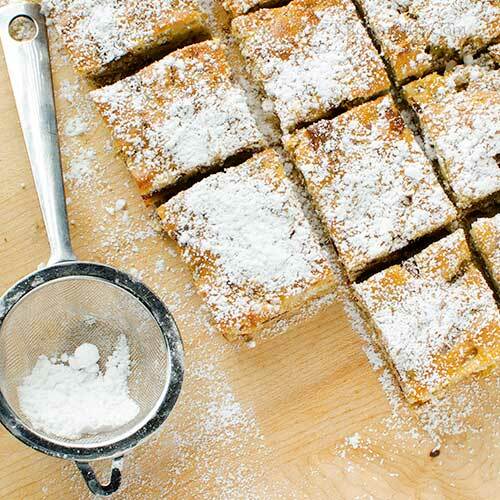 This recipe calls for just a light topping of (optional) powdered sugar. They’re simple to make, but very tasty. Mrs. Kitchen Riffs is the baker in our household. She adapted this recipe from one she found in Sweet Maria’s Italian Cookie Tray, by Maria Bruscino Sanchez. Prep time for this recipe is about 20 minutes. Baking time is 20 to 25 minutes. Then you’ll want to let the squares cool for a while after they come out of the oven (at least 30 minutes; an hour is better). This recipe yields 2 to 3 dozen squares, depending on how large you cut them. They keep well for several days if sealed in an airtight container, refrigerated or not. Preheat the oven to 350 degrees F. Line a 12x16-inch cookie pan with parchment paper (see Notes). Set aside. In a small bowl, whisk together the flour and salt (see Notes). Set aside. In the bowl of a stand mixer (or in a large bowl, using a hand mixer), cream together the butter and sugar. Add the vanilla extract and mix until well blended. Beat in the eggs. Chop the dates, removing the pits as you go. Add the chopped dates to the butter/egg mixture and blend well. Chop the walnuts. Add the chopped walnuts to the butter/egg mixture and blend well. Add the dry ingredients (flour and salt, Step 2) to the cookie mixture and mix until well blended. Spread the cookie mixture around the bottom of the prepared cookie pan, smoothing it as much as possible. Bake for 20 to 25 minutes, or until the top is starting to brown and is becoming firm. Do not overbake. Remove the cookie pan from the oven and allow it to cool on a wire rack. Cut the cookies into squares measuring about 2 inches (or whatever size you prefer). Sprinkle with powdered sugar, if desired, and serve. Make sure to use a cookie pan that has sides of at least one inch. Why whisk together the flour and salt in Step 2? So that you thoroughly incorporate the salt into the flour. You want the salt evenly distributed throughout the batter, and this is the easiest way to do it. Eggs carry a slight, but real, risk of salmonella. So when we make baked goods – or anything that we might taste raw, like the batter in these squares – we generally use pasteurized eggs. Most supermarkets carry them. They’re a bit pricey, but worth the peace of mind. We use kosher salt in baking and cooking. Its flakes are larger than those of regular table salt, so it’s less salty by volume. If using regular table salt, start with only about half of what we suggest. Although dates are available in supermarkets throughout the year, we always see more of them around this time (holiday baking season). Dates are the fruit of date palms, which often thrive in desert areas. Egypt is the largest producer of dates, but they’re grown throughout the Middle East. They’re also grown in the US (especially California and Arizona). The dates you see in US supermarkets are usually domestically grown. There are hundreds of date cultivars, but the Medjool is probably the one most commonly found in US supermarkets. You’re unlikely to find truly “fresh” dates – i.e., ones that have just ripened (those have a somewhat astringent flavor). What you see in the produce department at most supermarkets are “cured” dates – ones that have been partially dried. You can store cured dates in a sealable container at room temperature for a couple of months (and up to 8 months if refrigerated). You can eat cured dates out of hand, if you wish, though we find them a bit too sweet. They’re wonderful in baked goods, however, where they add flavor, sweetness, and moisture. “Say, isn’t that your third one already?” asked Mrs K R.
Uh, yeah. But they always say it’s important to have three squares a day. Hi Gerlilnde, a square (or three) would go wonderfully well with your coffee! Thanks for the comment (and Merry Christmas!). A cookie that doubles as breakfast? You know I'm in! They look fantastic! Hi Kelsie, these make a wonderful breakfast! Ask me how I know. :-) Thanks for the comment. Hi Tricia, one isn't enough, is it? :-) Thanks for the comment. LOL...you two are just funny haha! These date nut bars look fantastic! Hi Angie, :-) These really are good -- can't resist them! Thanks for the comment. Dates in the Midwest (like St. Louis or Ann Arbor) mean mainly Medjool dates, cured as you say. During our occasional stays in California I was amazed at the selection from date farmers at open-air markets. They grew around 4 other varieties as well as Medjool, and always offered tastes of their produce, often truly fresh. It's been a while since I made any date bars: I usually just eat them directly from the package or use them in sweet-savory stews like Moroccan tagines. I agree that your lighter recipe would work very well. These sound and look amazing. I love that they are loaded with dates and walnuts. No skimping here! These look super! I really enjoy dates, especially at the holidays. This looks perfect for any time of the day. These look and sound lovely! I wonderful if you could fold in whipped egg whites to make the batter even lighter? I admit I love the old fashioned streusel version but the real truth is I just love dates...I know these would be met with huge satisfaction! Hi Ansh, :-) I do like streusel, but the flavor of these is fantastic! Really good stuff. Thanks for the comment. Hi Mae, you're right, of course, that in date-growing areas fresh dates are readily available during harvest; and there are more varieties available. But cured dates are really the way to go for this recipe. And dates in tagines are wonderful! Thanks for the comment. Hi Laura, we never skimp! :D Thanks for the comment. Hi Amy, I think most of us will eat this as a snack or for dessert, but it really does make a good breakfast. :-) Thanks for the comment. Hi Mimi, hadn't thought about the egg white -- it's definitely worth a try! Sounds to me like it'd work. Thanks for the comment. Hi Barb, I like the streusel variety, too, but the flavor of these is amazing. And when it comes to the pickup lines, I know, I know. :-) Thanks for the comment. Cake for breakfast wins me over every time! In fact I think it would be the perfect date night breakfast. Well, you know what I mean! Hi Abbe, perfect date night breakfast indeed! :-) Thanks for the comment. Date goodies always remind me of Christmas mainly because I devoured an entire plate date-filled oatmeal cookies when I visited her during my university days. Her Mom was perplexed as to how I could eat so many cookies but I did! These squares look wonderful and I bet they are also quite delicious. Hi Eva, it's easy to eat way too many date goodies. These especially -- they're SO good! Thanks for the comment. These squares look so delicious... these and a cup of coffee= big smile! Hi Denise, big smile indeed! :D Thanks for the comment. Hi Greg, good point! :-) Thanks for the comment. 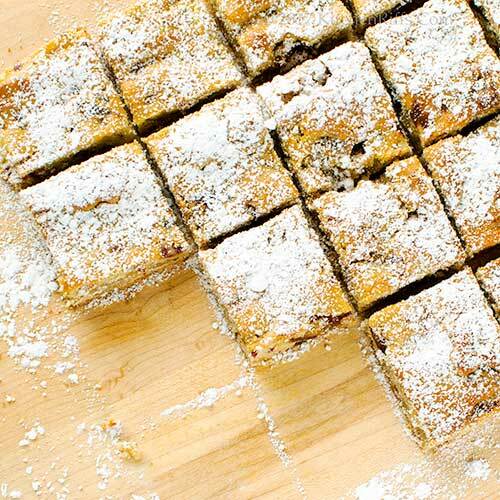 Dates and walnuts are a match made in heaven, these bars look heavenly! Date bars are a favorite here -- my husband devours them. But the recipe I use sandwiches a rich date filling between two layers of dough. I find them very sweet and heavy -- I'm definitely going to try this one. Thanks, John. Hi Chris, they ARE heavenly! :-) Thanks for the comment. Hi Madonna, you're right -- dates are exactly like candy. So sweet! Thanks for the comment. Hi Judy, these are terrific with tea or coffee. Or a glass of sherry. :-) Thanks for the comment. Hi Rosemary, we've made that "sandwich" type of recipe. Good, but really sweet as you say. These are less sweet and much lighter -- really worth a try. Enjoy! And thanks for the comment. Yum. I know my entire family would love these date walnut squares. Hi Pam, I bet you're right that everyone in your family would enjoy these! Thanks for the comment. Oh a lighter date walnut squares, I really like that concept a lot! They are so good but often too heavy. Just might try these over the holidays! I absolutely adore squares/bars, this combo could very well be my next favorite. Great dialog with Mrs. K R! Hi Evelyne, we love the traditional date-walnut squares. But they really are kinda heavy. These? Well, three is a "serving." :D Thanks for the comment. Hi Cheri, you'll like these -- TONS of flavor. And not as heavy as the traditional squares. Thanks for the comment. These do look lighter than the ones I'm use too. I've never been a fan because of the density of these bars. It's certainly not because I don't like walnut and dates. I love them! So thank you Mrs. KR for creating a lighter version. Hi MJ, these are much lighter than the traditional ones. And we think the flavor is better. :-) Thanks for the comment. My mom used to make date walnut squares! Thank you for reminding me about how wonderful they are! They would be a wonderful addition to any holiday cookie extravaganza. Hi Deb, dates and walnuts are so nice together! And wonderful in baked good. :-) Thanks for the comment. This recipe actually reminds me of Mrs. Pike's Fruit Cake. A Fruitcake that always randomly wound up at our house for New Years every year and everyone would joke about it - kind of making fun of it, but then eating it and adoring it! ha! Hi GiGi, with the dates and walnuts this does have a bit of a fruit cake flavor to it. Kinda. Sorta. :-) Much less dense, though. Thanks for the comment. Yes, I can see why you might want to eat two or three of these date bars! Date trees take years to propagate the fruit so you can certainly appreciate dates when you eat them. Say, I just read your recipe on slow-cooked ribs- must try these soon! Ooh, that's my kind of recipe. Dates and walnuts.. count me in. This looks so delicious, a must try for this season. Hi Fran, date are wonderful, aren't they? And that rib recipe is killer! Thanks for the comment. Hi Amira, dates and walnuts are wonderful together! Thanks for the comment. Hi Agness, you'll like this, I think. And these won't weigh you down (too much) when you're running! :-) Thanks for the comment. I'm afraid I would like these date squares just a little *too* much. I can see it now - just having "one more" *tiny* square every time I walked by! But you've never done that, I'm sure. Hi Jean, who, me? :-) I do it all the time! Thanks for the comment. Love dates in any shape or form. Nice that this recipe is a little lighter so now we can have 2!!! These sound like the perfect breakfast treat with a hot cup of coffee. Hi Bobbi, at this time of the year lighter is a necessity! :-) Thanks for the comment. Hi Pamela, these are terrific with coffee. :-) Thanks for the comment. Love your banter....and your photography is fabulous! These look fantastic. I love dates because they're sweet without being *too* sweet. And the combination with walnuts takes it over the top. Hi Robyn, my mom made the traditional date bars too. I do like the streusel topping, but it's heavy! These have all the flavor -- more, really -- and are lighter. Well, as light as a date bar can be. :-) Thanks for the comment. Hi Frank, love dates in baked goods! Their sweetness is perfect for them. Thanks for the comment. Love this classic combination of date and walnuts! These look so moreish! Hi Marcellina, good combo of flavors, huh? :-) Thanks for the comment. These would be perfect for date night! I haven't made date bars in a long while! They do seem made for the holidays, though! Hi Debra, these are ideal for date night! :-) Thanks for the comment. Hi Carolyn, dates really are sweet, aren't they? This dish is certainly sweet, but not overly so. :-) Thanks for the comment. I am sold out to this recipe! Hi Taruna, it's an excellent one! Enjoy. :-) Thanks for the comment. I love dates so I know I would love these lovely looking squares. Hi Emma, dates are great, aren't they? As are these lovely squares. :-) Thanks for the comment. I love dates and will be happy to use them in a new recipe :) thank you! Hi Marta, hard to resist a date, isns't it? :-) They're so good in this recipe! Thanks for the comment. Hi Cakespy, didn't know about National Date Nut bread day! And you're right -- close enough. :D Thanks for the comment. Hi Anne, dates are like the perfect food, right? Or at least awfully good. :-) Thanks for the comment. Hi John, I'm loving this one! Hi Liz, these are really good -- definitely worth trying. :-) Thanks for the comment.